taken by the Cassini spacecraft in 2005. I’ve always been intrigued by the moons in our solar system. Each has a unique personality. Take Enceladus for example. In 2005, while orbiting Saturn, the spacecraft Cassini observed this unique moon up close for the first time. It seems peaceful enough with an icy surface on its south pole. Without warning, geysers of water and ice are ejected, blasting hundreds of kilometers into space at over 2,000 kph, making it the largest snow-making machine in the solar system. The spray of icy particles coat the small moon, giving it a clean, white surface. It is the most-reflective body in our solar system. 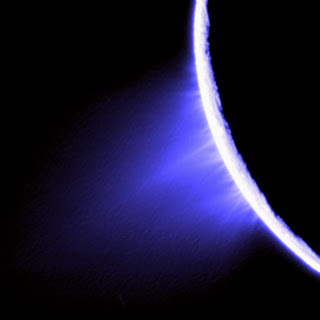 Enceladus has a frigid atmosphere, but it must have a liquid ocean beneath its icy surface. We know this because Cassini was able to capture and analyze the ice particles on several of its flybys, and it discovered that the ice was salty. So the ice must have come from salty ocean water since if it were surface ice there would be very little salt in it. Ocean water is ejected and freezes to form ice particles when it hits the frosty atmosphere. The subsurface water is heated enough to remain liquid through a combination of tidal heating and radioactive decay. Enceladus has a slightly elliptical obit of Saturn which causes gravitational flexing, generating heat. And where there is liquid water, you have environmental conditions favorable to the emergence of life. It is also thought that Saturn’s outermost ring, known as its E ring, is supplied by the material from the jets of Enceladus. Enceladus orbits in the densest part of the E ring. In 2009, Cassini found salty ice grains in Saturn’s E ring. About 200 kilograms of water vapor is ejected every second in these plumes. Smaller amounts of ice grains are also ejected. Without the Cassini mission which can sense these compounds in its close flybys, we would never know just how fascinating this moon is.